This first issue of the annual poetry journal Lummox is a great unwieldy beast of a thing. Two hundred and thirty pages of closely-packed text, with, as the cover is at pains to point out, over 160 poets included, along with interviews, articles, featured poets sections and testimonials to others recently dead. And when I say packed, I mean it. Poems are frequently bent out of shape to squeeze an extra one on the page, and everyone gets their biographical note at the foot of their contribution. The overall sense of clutter is largely a product of editor RD Armstrong’s ambitious approach as outlined in his informative introduction. There are a dozen guest-edited sections intended to represent either a region of the States, a loose-knit school or, in one case, Nigeria. The editorial process for these sections was that the guest editor selected the poets, asked them to submit 3 or 4 of their favourites from among their own poems and then Armstrong whittled this down to 1 or 2 each. Interleaved between these are eleven numbered sections called ‘The Poetry I to XI’, containing the seventy five additional submissions that Armstrong had already accepted. The titling of these sections has the unfortunate, and presumably unintended, consequence of at least implying that the remaining verse may be something other than poetry. To be fair, this is not the case. While little of the work presented lives up the ‘fantastics’, ‘marvelouses’ and so on that pepper most of the guest editor introductions, the vast bulk of it is perfectly competent, the product of that vast army of semi-professional poets that inhabit the world of local poetry groups, creative writing workshops and residencies that form such a dominant part of the American poetry landscape, at least if the individual bios are to be believed. There is little difference in quality or tone between the guest-edited contributions and the rest. The dominant influences are the plain speech of William Carlos Williams, but without his acuteness of perception, the hallucinogenic cowboy effects of Ed Dorn, but lacking his metaphysics, the earth-mother Buddhism of Diane di Prima, minus her energy, the debauchery of Charles Bukowski, without whatever it is of merit that people find in his verses, and, oddly, a smattering of Eavan Boland’s early-period domestic politics. This is, I suppose, what happens when an avant garde style become the everyday manner of a body of poetry. Surveying these 160 writers, almost all Americans, you would be forgiven for believing that nothing new had happened in the world of US poetry since about 1963. The one section that doesn’t conform to this pattern is the Nigerian one, where the primary impression is of reading texts that were written in the authors’ second or third language, which is probably the case. and one of the featured poets, the late Kell Robertson worked the outlaw mode with more conviction that most. Among the essays, interviews and reviews at the back there’s an impassioned rant by Jack Foley against the professionalization of poetry as a result both of the proliferation of MFA programmes in American universities and what he calls the tolerated poetry ghettoes of ‘the coffee house, the college or university, the precious little literary group, the workshop, the library and the bookstore or museum’. It reads like a direct attack on most of the preceding 160 biographies and, indeed, on the likely readership. 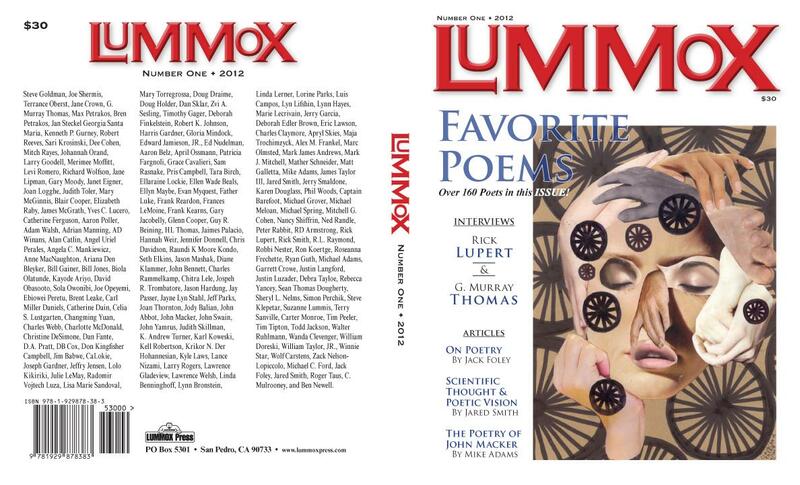 The most positive outcome of reading Lummox is that it made me ponder what it is I want from a poetry journal. I don’t want bulk-purchase poetry; I want an editor with a clear vision of the kind(s) of work that interests them and the ability to be brutally selective in presenting it. I want generous and representative selections from each poet that are given space to breathe on the page. Most of all I don’t want to be told how great the poetry is; that’s a judgement for me to make. I’ll assume the editor believes in it anyway.